People who aren’t fans of the DC comics and TV shows may be surprised at how deep they are. 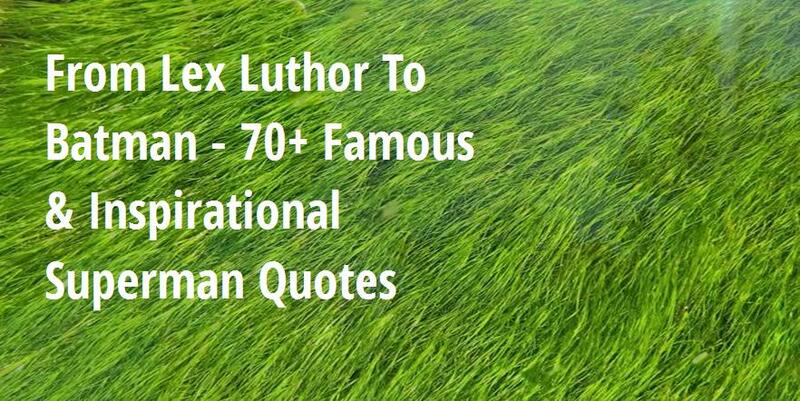 Lex Luthor’s favorite philosopher is Nietzsche, the existentialist who believed that human beings could be perfected into the Übermensch, or Superman. Through the plots of the TV shows, comics, and movies, the Superman and Batman series explore what it means to be human. Batman has difficulty finding love because of his tragic family backstory. Superman has an easier time with Lois Lane. 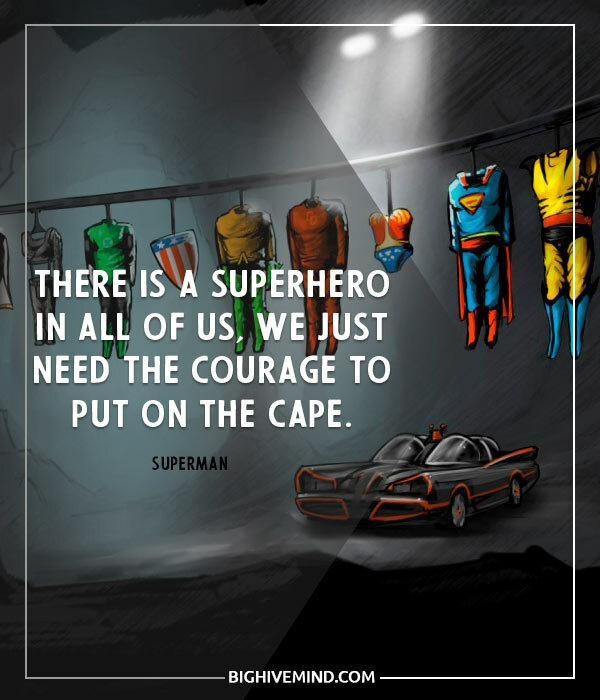 Superman and Batman are serious heroes, but their quotes can be funny too. These quotes show the best of the Superman and Batman series. You’re much stronger than you think you are, trust me. You will give people an ideal to strive towards, they will race behind you they will stumble, they will fall, but in time they will join you, in time you will help them accomplish wonders. We all have our little faults. Mine’s in California. Believe in truth. Believe in justice. Believe in the hope for their greatness. And if, through your actions they yearn to be great, too, then you will have done far more for them by making all their burdens your own. Do not fear to help them where they need help, but do not impose yourself on them. Gods can become devils far too quickly. Reliance on your own powers will destroy them. Belief in your values will give them strength. Do you know why the number two hundred is so vitally descriptive to both you and me? It’s your weight and my I.Q. 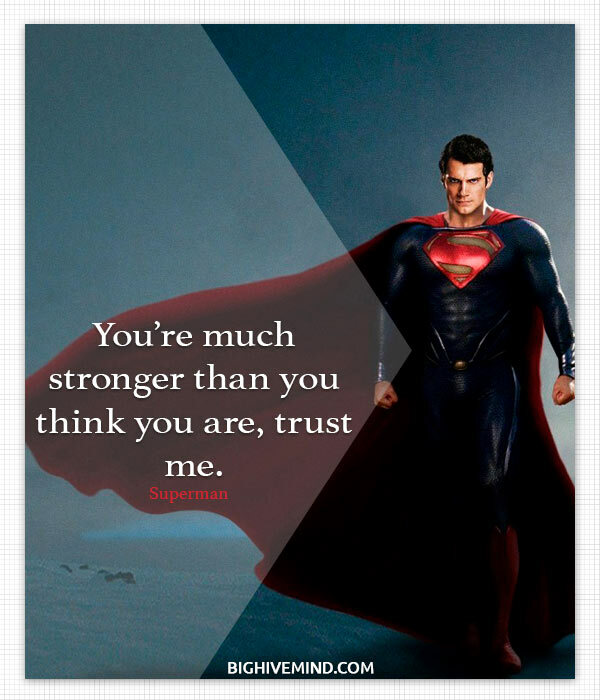 Live as one of them, Kal-El, to discover where your strength and your power are needed. Always hold in your heart the pride of your special heritage. They can be a great people, Kal-El, they wish to be. They only lack the light to show the way. For this reason above all, their capacity for good, I have sent them you… my only son. This is Lex Luthor. Only one thing alive with less than four legs can hear this frequency, Superman, and that’s you. Lex, you’re not a God. 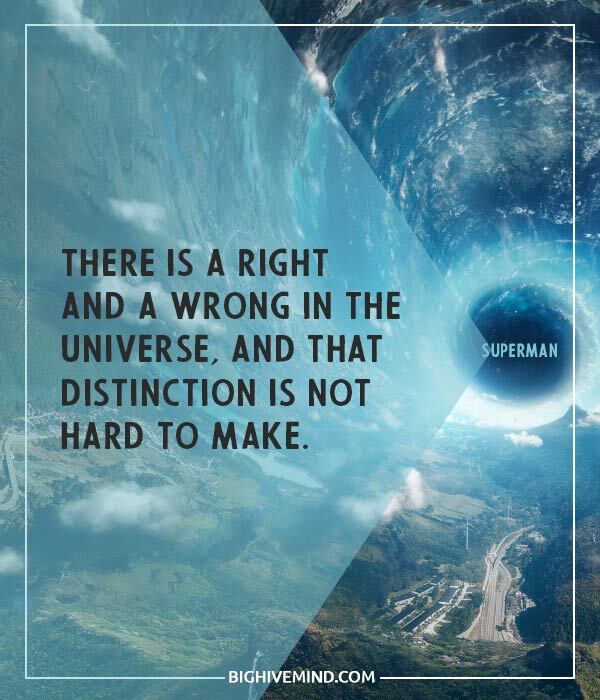 There is a right and a wrong in the universe, and that distinction is not hard to make. Remember us, son. Always remember us. Can you read my mind? Do you know what it is that you do to me? I don’t know who you are. Just a friend from another star. Here I am, like a kid out of school. Holding hands with a god. I’m a fool. Will you look at me? Quivering. Like a little girl, shivering. You can see right through me. Can you read my mind? Can you picture the things I’m thinking of? Wondering why you are… all the wonderful things you are. You can fly. You belong in the sky. You and I… could belong to each other. If you need a friend… I’m the one to fly to. If you need to be loved… here I am. Read my mind. You are weak, Son of El, unsure of yourself. The fact that you possess a sense of morality, and we do not, gives us an evolutionary advantage. And if history has proven…It is that evolution always wins. 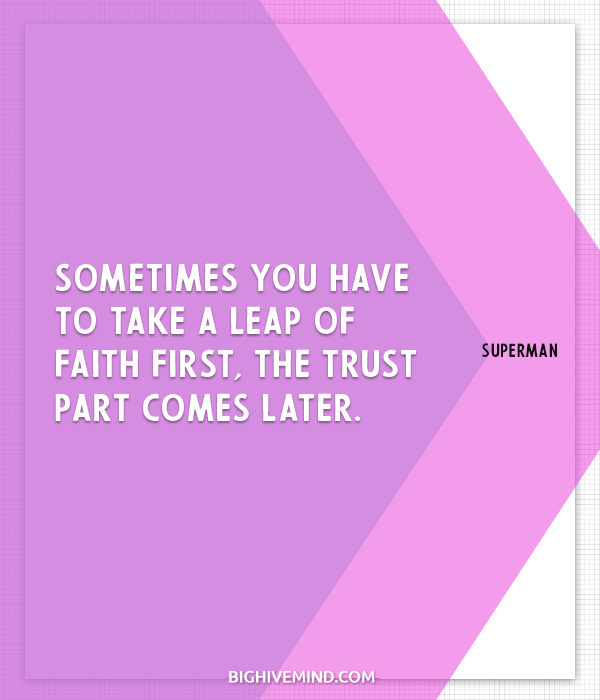 Sometimes you have to take a leap of faith first, the trust part comes later. Is that how a warped brain like yours gets its kicks? By planning the death of innocent people? YOU THINK YOU CAN THREATEN MY MOTHER? What was I supposed to do? Let them die? I just want to bring fire to the people, and I want my cut. That ship that appeared last night, I’m the one they’re looking for. Now listen to me, I tell you boys and girls – whichever one of you gets it out… is going to wind up with the single most important interview since… God talked to Moses! My father believed that if the world found out who I really was, they’d reject me… out of fear. He was convinced that the world wasn’t ready. What do you think? You’ve grown stronger here than I ever could have imagined. The only way to know how strong is to keep testing your limits. You can save them. You can save all of them. Make a better world than ours, Kal. You’re scared of me because you can’t control me but that doesn’t mean I’m your enemy. Don’t tell me: he sends a check every week to his sweet, grey-haired old mother. The ‘Amazing’ can only be created by facing fear, risk, and failure during the process. I hope this hasn’t put you off of flying. Statistically speaking, it’s still the safest way to travel. Lois, Clark Kent may seem like just a mild-mannered reporter, but listen, not only does he know how to treat his editor-in-chief with the proper respect, not only does he have a snappy, punchy prose style, but he is, in my forty years in this business, the fastest typist I’ve ever seen. I believe in second chances, I believe in redemption, but, mostly, I believe in my friends. Your name is Kal-El. You are the only survivor of the planet Krypton. Even though you’ve been raised as a human, you are not one of them. You have great powers, only some of which you have as yet discovered. There’s one thing I do know, son, and that is you are here for a reason. I don’t know whose reason, or whatever the reason is. But I do know one thing. It’s not to score touchdowns. You will be different, sometimes you’ll feel like an outcast, but you’ll never be alone. You are not alone. You are not alone. You are not alone. My name is General Zod. I have journeyed across an ocean of stars to reach you. For some time your world has sheltered one of my citizens. He will look like you but he is not one of you. To those of you who know of his location, the fate of your planets rests in your hands. I request that you return this individual to my custody. To Kal-El, I say this, ‘Surrender within 24 hours of watch this world suffer the consequences. I feel like I live in a world made of cardboard…always taking constant care not to break something…to break someone, never allowing myself to lose control even for a moment or someone could die. I’m here to fight for truth, justice, and the American way. So many of our dreams seem impossible, they seem improbable, and then, when we summon the will they soon become inevitable. No, but this General Zod… even if I surrender, there’s no guarantee he’ll keep his word. But if there’s a chance I can save Earth by turning myself in, shouldn’t I take it? Easy, miss. I’ve got you. You – you’ve got me? Who’s got you? Can’t I just… keep pretending I’m your son? Cute kid. And smart too. But we’re not really strangers are we? Dreams save us. Dreams lift us up and transform us. And on my soul I swear until my dream of a world where dignity, honour and justice becomes the reality we all share, I’ll never stop fighting. Ever! Goodbye, my son. Our hopes and dreams travel with you. Gods are selfish beings who fly around in little red capes and don’t share their power with mankind. It doesn’t take X-Ray Vision to see you are up to no good. You’re gonna end up fighting every elected official in this country! Show them their possibilities, but never choose their path for them. They must advance on their own, find their own way, make their own mistakes, conquer their fears and hatreds, and create their own history. Excuse me, Mr. White. I was wondering if, if, uh, perhaps you could arrange for half my salary to be sent to this address on a weekly basis. No, by causing the death of innocent people. They’re a good people, Kal-El. They need only to be shown the way. You ARE my son but somewhere out there you have another father and he sent you here for a reason. And even if it takes the rest of your life, you owe it to yourself to find out what that reason is. Well you’re back and everyone seems happy about it. He will be an outcast. They’ll kill him. Zod can’t be trusted. The problem is, I’m not sure the people of Earth can be either. All those things I can do. All those powers. And I couldn’t even save him. No matter how violent, every action I take is for the greater good of my people. The only way to know how strong you are is to keep testing your limits. What if a child dreams of becoming something other than what society had intended? What if a child aspires to something greater. You’re not just anyone. One day, you’re going to have to make a choice. Whether to stand proud in front of the human race or not. You have to decide what kind of man you want to grow up to be. Whoever that man is, good character or bad, it’s going to change the world.